What is the studio tour? 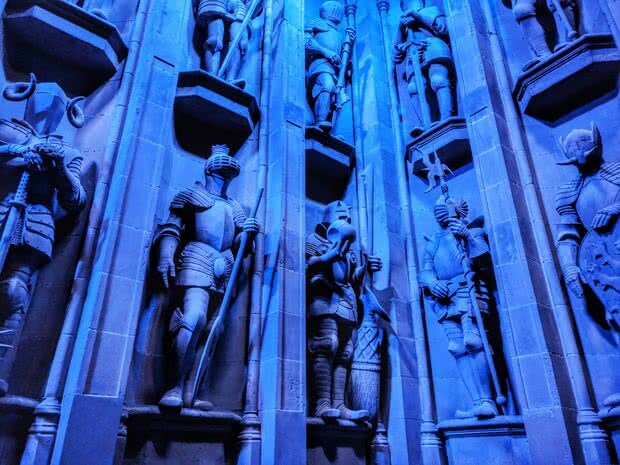 It's the sets, creatures and sights from the Harry Potter movies, a Cathedral to creativity. The goal is to bring you to appreciate the artistry of the film makers and get a bit closer to Harry's world, but not rides. I found it a moving experience, but then I'm a sentimental Edinburgh Potter tour guide. If you stop for lunch, a day can happily be spent at Warner Brothers Studio, this is how to do it right. There's just something so adorably guileless about Muggles; it's not about what spells you know, it's what you can stuff your face with. The crack-of-dawn 9am entry is best because unless youâ€™re driving there, there are frustrating bottlenecks which waylay your entry, these will be magnified if you come later and youâ€™ll be queueing at the back of people who are already late themselves. During the holidays it has 6000 visitors daily and most of those arrive towards lunchtime. Are the easiest and worst way. They're good because it may include a guided tour & you can buy tickets after Warner Brother's website has sold out. They are bad because bus transport in London is slow, you won't be left enough time for self-exploration, even if it arrives at opening, you'll have to hang around while they organised tickets and the studios fill up. They are for the desperate. take 20 minutes from London Euston, which itself sits on the underground. Google Maps train times to Watford are reliable. Despite the cautionary posters on the trains about travelling without a ticket, the assistants will tell you itâ€™s fine to use contactless Debit cards to swipe in and out of the ticket barriers, the fare will be credited from your account in a couple of days time. Lifeâ€™s getting easier and my Londoner friend says both Inspectors and Oyster cards are being phased out. Cost Â£2.50 return, which is cheaper than the local buses. However itâ€™s also bottleneck no. 1. You will likely not be able to board the bus when you get to the station. Thereâ€™s a long snaking queue. The buses are frequent and the trip takes 10 minutes, but that long snaking queue is what youâ€™ll be standing on the end of when you reach the studios. Except it maybe even longer, Warner Brothers has more security than parliament. 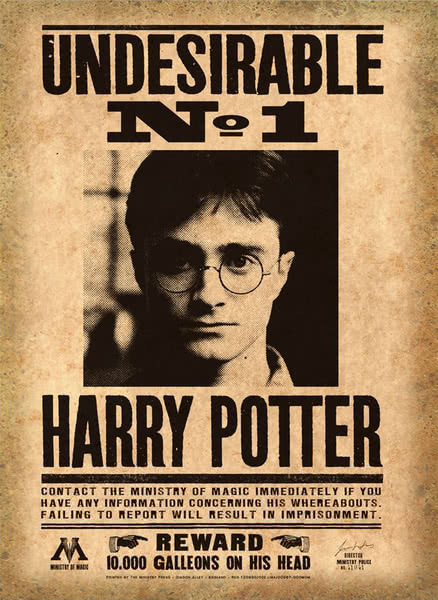 Few people care about Muggle gas-bags but the boy who lived is a pillar and icon of British liberal culture and needs to be protected from Deatheaters. Meals in the cafe are actually competitive. Â£8 for a Muggle main course, but they will allow you to sit with your own packed-lunch. Splurge on the audio guide? It's in various languages, the boards are only in English, so if reading English is hard for you, the audio guide will enhance and lengthen your visit. I was alone, the benefit of the guide for me was I got a bit more out of my visit. It's an android device with a standard headphone jack, if you bring a headphone splitter you could have a partner listen in too. However the boards and videos throughout are very good, the ones with Warwick - Griphook the Goblin - Davies particularly amusing, so if youâ€™re with companions Iâ€™d pass on the guide unless others are keen. Accompanying a staff member is however a different matter, they seemed to pick out the most interesting stories and are more curated than the exhaustive audio guide. It costs Â£225, it's the A-lister experience. Harry: Did you know my tour has made Warner Brothers $435.7 million since it opened? There are benefits to autonomous exploration, you have time to watch the video and read the boards, which you wouldnâ€™t on a guided tour. Alan Rickman's black Snape costume had two buttons, he asked for more to show his character was buttoned down and secretive. To keep kids engaged they can play spot the gold snitches through out. Ask a staff member about this. Thereâ€™s a little controlled queue for Butter beer, a shorter one for collection. So ordering ahead might be a happier thing if you canâ€™t get 9am entry. Butterbeer appeared to be cream-soda with a butterscotch head frothed on top. This was the best bit and I grabbed a plastic Spoon and spooned the dregs out. A foamy butter beer beard is the tastiest in the world, good for struggling dates perhaps. Butterbeer's foamy head is delicious, but Oh Lord! If they changed waterboarding to butterbeer boarding the CIA would have queues. They might even be able to charge Â£6.95 for it. Butterbeer ice cream, enough already? 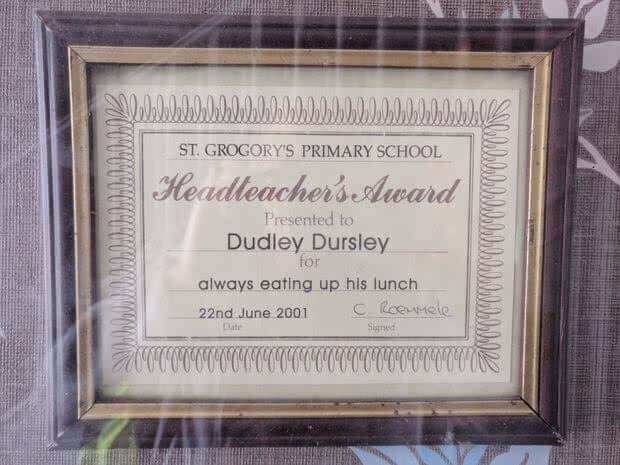 Nah, eat like Dudley & stuff your face. Scoff scoff scoff. Â£4.95?! It's all expensive, however Warner Brothers are determined not to be called stingy, so the Mr Whippy ice cream is mountainous. It starts by punching you in the mouth with butterscotch but 10 minutes later, at the end of the giant tottering whirl, it tastes of cold air. And it feels like you've eaten a meal. Youâ€™ve Butterscotch bombed your stomach. I think this is what it tastes like if you sit beneath an ice cream machine with your mouth agape and it just slides down. Edinburgh's Overlangshaw Farmhouse often offers Butterscotch ice cream, which some visitors have said tastes 'just like Butter brew!'. Sadly it's not churned by the feet of tireless House Elves imprisoned inside a metal box, but by sunbathing Scots on a farm down in the Borders. 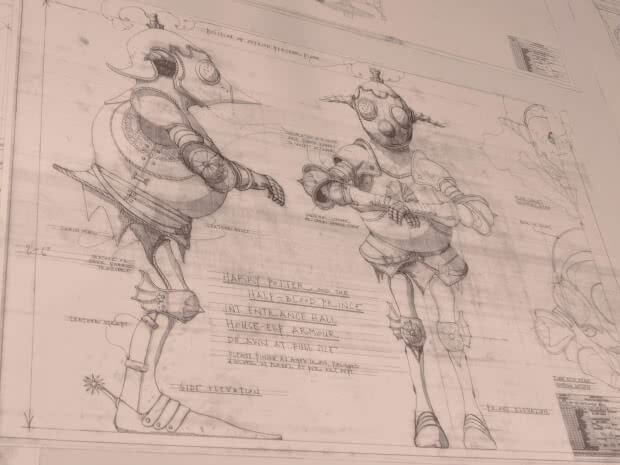 Is predominantly more interesting bits from the boards around the studio tour, it is a memento, and they will recommend you collect it at the shop at the end of the tour so you donâ€™t have to carry it around the whole thing. If you are gifted with the time and patience to read the boards thereâ€™s little benefit, youâ€™ll probably take a bunch of photos yourself which take up no space and you can maybe trust the interesting stuff to stick in your memory. Has excited complaint from parental bodies on the internet, you stroll through it at the end of the tour. If youâ€™re Weasley stretched this is maybe not the funnest moment, as an adult I found it nice to look. The shop is vast, it goes on and on like the maze in the Goblet of Fire; it's far larger than our atmospheric Potter shops in Edinburgh. I already had my trophy, a Butterbeer cup Â£3. Chocolate frogs in a lavish hexagonal box: Â£6. An exact replica of Dumbledore's costume: Â£499.95. I think Warner Brothers is saving money for the bus. It's diamonds for Potter heads, the products are luxurious, folk feel their decadence. Who needs money? The queue began passing Harryâ€™s cupboard allegedly with Daniel Radcliffeâ€™s original glasses from the film, it seems as though somebody wanted to get their Mundungusâ€™s worth from the Â£45 entry cost and has nicked them. Fair play. We filed into a hall and watched TVs turned on their sides - you can tell youâ€™re approaching a magical realm, we had newsreels charting Potter-mania across the globe. They're establishing why Harry Potter is important, Muggle orientation. The lady who presented it was droll and Iâ€™m feeling this is a very managed experience. Doors opened and we moved into the next managed experience, a very comfortable cinema. The guy who presented this bit was a touch less amusing, more earnest. I think if everyone doesnâ€™t go watch Fantastic Beasts The Crimes of Grindelwald, Warner Brotherâ€™s will fire him. The lights dimmed, and up came the golden trio, Daniel Radcliffe insulting Cruikshank's, Emma Watsonâ€™s cat, and talking about growing up on the studio lot, amongst the sets we were soon to see. The managed experience paid off by the bucketload, entering the great hall and having a few things picked out by the guide was a wonderful experience. As you can see when I was there the great hall had neither candles nor enchanted ceiling. In fact when I looked up it was inky black with lighting rigs like I was inside a film studio, weird. It ended with a little bit of theatre to cap it all. 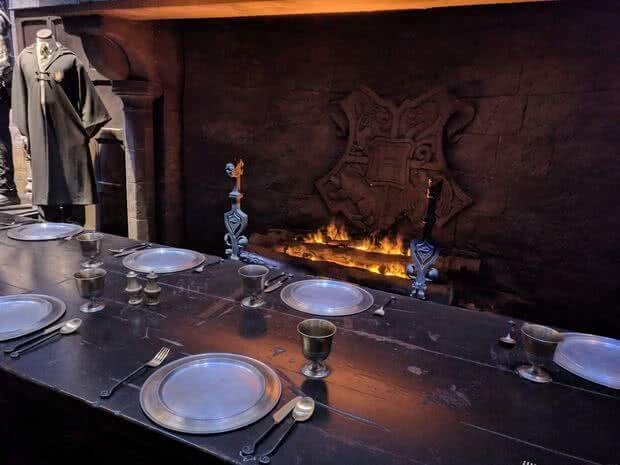 The bloomin' Potter heads get in the way in the video but behind the Goblet are white bearded manequins of Fred and George Weasley, sprawled on the floor after being thrown away from it. Such loving attention to detail. The first few video pieces on the directorâ€™s aims for their respective Harry Potter films were some of the most interesting of the whole exhibition, donâ€™t let the drama of the great hall ADD your concentration here. For instance Mike Newell, the director of the Goblet of Fire, was a product of an English boarding school, he wanted Hogwartsâ€™ to be 300 little anarchist testing themselves against authority, against authority to destruction. He wanted his entry in the saga to be a paranoid thriller like Hitchcockâ€™s North by Northwest. This is probably how he pitched it to Warner Brothers and they liked his fresh vision. Now you might know that Dumbledore in the Goblet of Fire is a great pain to Potter-purists. He leaps up and shakes Harry. Fans feel Dumbledore is really a kind wise old wizard, he wouldnâ€™t be running around menacing the boy who lived. But now we know why, actor Michael Gambon is enhancing the paranoid, explosive atmosphere the director wanted for his film. Although apparently Newell fought Warner Brothers, they thought the book merited 2 films, but to make a thriller Mike needed the plots twist to come thick and fast, so persuaded them out of it. Hmmmm. Well his head can't be everywhere at once. It feels bizarrely small, I guess all the out of focus shots in the movies muddled my sense of itâ€™s size. In reality it feels suitably cosy. 14 foot beds were created for the first film, but the set never changed for the later films, when Ron and Harry grew too large for their beds, theyâ€™d just take the end off them and shoot their supine bed scenes more carefully. A nice visual effect has been created for visitors, that those on the Deluxe guided tours wonâ€™t have time to see, so dip your head close and watch the mana crackle. The thing I love most about the headmasterâ€™s office, is the origin. The grand tower with the three dinky ones coming off it, stacked one upon another had been on the Hogwartsâ€™ model for sometime, and the set designer thought â€˜what if Dumbledoreâ€™s office was there?â€™. So he has an open-plan office spread over 3 intersecting towers, a geography on the edge of Muggle possibility and so novel itâ€™s magical. Well this is a wholly new addition, and it is even better than the films. It begins by meeting a Hippogriff in a glade. 3 animatronic Hippogriffs were made for the movies, one kneeling, which we see in the Prisoner of Azkaban, and 2 standing, neither of which we see in the movies. So the one I bowed to I'd never averted my eyes to before. They didnâ€™t have much of the old forest set left, so they recreated it, and the idea is you are plunged into the heart of the forest, the densest darkest part, if your spine can tingle, this will do it. The cafe come next, although If itâ€™s warm and sunny there is more seating outside the cafeteria on the backlot. Having lunch beside the windy Hogwarts-bridge and purple triple-decker Knightbus is more atmospheric than a heaving canteen. For the final film director David Yates wanted complete control of Privet drive so they built a copy of the location on the studio backlot. This is outside the filming hangers where they build anything which would benefit from a 180 degree uninterrupted horizon and a loving sun. Dwarf actor Warwick Davies had three different educational films, you have to chase him from wall to wall. He and the man in charge of creature effects zing one liners at one another and rather pleasingly interact from their video with the mechanical creatures on the work-desk in front of the screen. Warwick as Griphook and dwarf Professor Flitwick is a very minor part of the films but on the studio tour he is the absolute star. 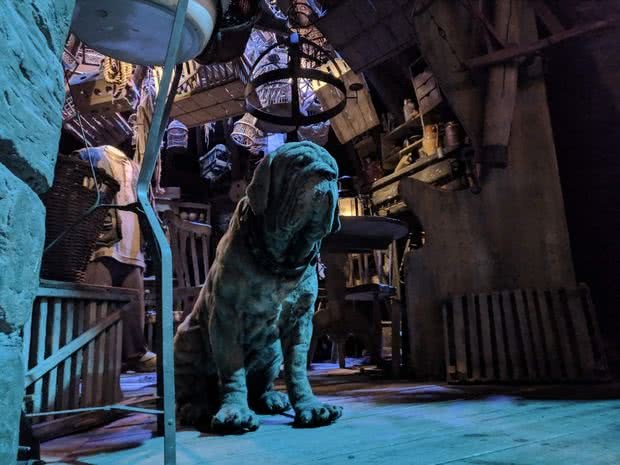 One of the things you wonâ€™t learn from Davies is Dobbyâ€™s designer based him on the studioâ€™s German shepherd, big eyes and floppy ears makes you fall in love. Director Alfonso Cuaron wanted the set and filming to reflect the characters emotions. Harry is filled with icy dread around the Dementors and there's lots of snow, frostâ€™s icy fingers reaching across windows, the world is corpse cold and dead. So spot which carriage of the Hogwartsâ€™ Express was used in Prisoner of Azkaban. 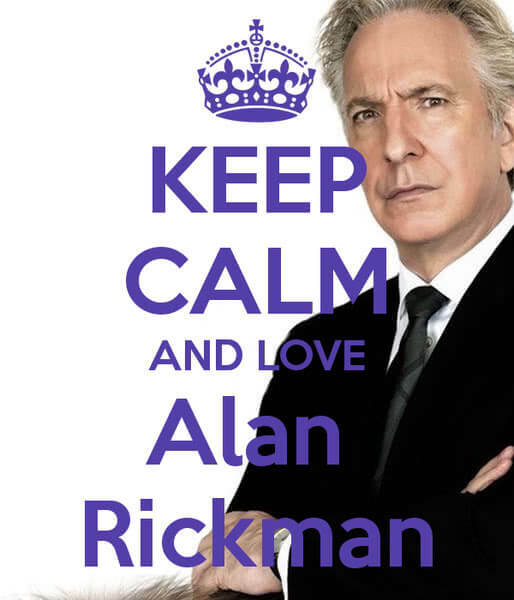 When beloved Alan 'Snape' Rickman caught a train on in 2016, I left part of my heart behind. According to the Telegraph a shrine of remembrance was begun on the station platform. The Hogwart's Express was mostly filmed on location, up in the Highlands or at Kings Cross, with the exteriors shots being St Pancreas station. But for the epilogue of the Deathly Hallows Part 2, director David $$$ Yates wanted complete control so they created the studio set. If you fancy seeing Rowling's Harry Potter & the Cursed Child sometime, this is where the story kicks off, at that exact moment, with Harry 19 years later on this platform, 9 point seven five. 2 things to note here, the art department spent a week creating a bust of a Goblin with a fish on his head, facing a wall, inside an Alcove. And itâ€™s not in the movies! The director just didnâ€™t want them sitting around for a week. Can you spot it? Second thing is the lavish attention to detail. 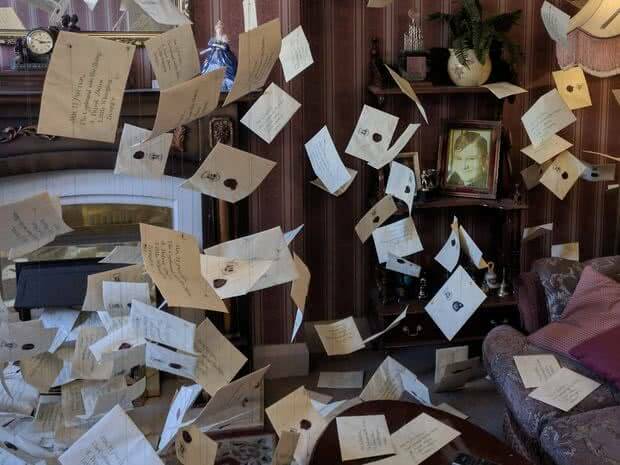 One of my favourite things is the window of Weasleysâ€™ Wizard Wheezes. Look for the Dolores Umbridge doll peddling a unicycle back and forth. The twins revenge for being busted off the Quidditch team by the High Inquisitor. No wonder their mother Molly said they would be murdered in their beds. Incorrigible. Eduardo Lima and Miraphora Mina led the design team to produce over 40 editions of the Daily Prophet and 25,000 plus pages of the Quibbler. Each with unique pages, stories, headlines, adverisements and games. The body text of each article was often in fake Latin but the headlines were English. To amuse they often included references to members of the cast and crew in them. JK Rowling said MinaLima's workshop was her "favourite room on Earth". They continue as designers for the 1920 set Fantastic Beasts movies. If only Dobby had worn this when he rescued Harry from Malfoy manor! Be still my bleeding heart. Pluck out thine cursed eyes, I found this too moving. The stirring music suggested the tour was coming to an end, that I was approaching the jewel. The view we enjoy, from the edge of the grounds is also mentioned in the play 'the Cursed Child', where it similarly moves the hero. In some panormaic shots in the movies thereâ€™s a certain painterly unreality to Hogwarts, sitting admist CGI fog effects, but it was always the model, with digital trickery to add atmosphere. Hogwartsâ€™ was of course destroyed at the battle of Hogwarts, but destroy the model and the director would only have one shot at getting it right. David Yates wanted total versatility, so it was laser scanned into a computer, blown up digitally, and survived. For the miniature trees and vegetation the original model used real living plants, I presume those have now been replaced. 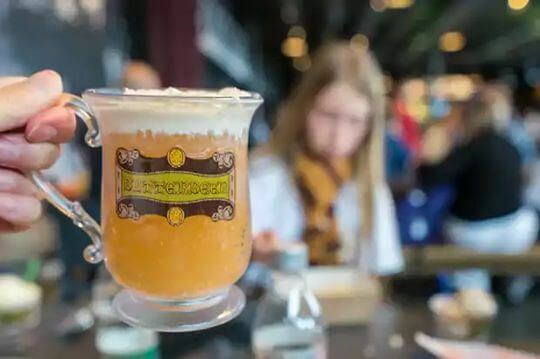 If you have the passion to read the boards, the Galleons to buy the butter beer and lunch and ice cream, this will be a moving and filling day out. Delight, excitement and stimulation equal with the Quidditch world cup. If itâ€™s on a bucket list because others have trod this path, rather than love, then the loss of Galleons may weigh upon you. Once youâ€™ve done the films, learn about the writing and the inspirations on my Edinburgh Potter tours. Originally Leavesden Studios was an airfield thrown up in 1940 for World War II. This was hugely expensive and so it became the base for 2 plane construction companies, making the Halifax heavy bomber and Mosquito fighters. It became the largest factory in the world. The runway remains, itâ€™s now the main road through the film studios, and the control tower has maniacal directors hanging off it shouting at crews. As time past and our aviation industry shrunk and relocated Leavesden airfield was abandoned. Excited about their new James Bond, Pierce Brosnan, Eon pictures rushed Goldeneye into production, without a studio to film in. Eon discovered Leavesden. James Bond is all set pieces & spectacle so they needed a large number of large-scale sets. Leavesdensâ€™ wide tall aircraft hangars were ideal. Eon gutted the factories turning them into stages and offices, a working film studio. They named it â€˜Cubbywoodâ€™, after Eonâ€™s veteran producer Albert â€˜Cubbyâ€™ Broccoli. In 1998 a galaxy far far away landed, George Lucas began filming the first Star Wars prequel. From 2000, in a cupboard under the stairs, the Harry Potter films began filming there. There were issues. None of the hangers were adequately sound proofed and when it rained the ceilings leaked. In 2010 a fire ravaged a set on the outside film lot taking firefighters an hour to put out. Theyâ€™d always planned a studio tour nebulously at some point in the future. Squirreling props away around Leavesden. As filming drew down on the Deathly Hallow part II, Warners knew they wouldnâ€™t be able to save the props from destruction, so they bought the studios for Â£22 million. 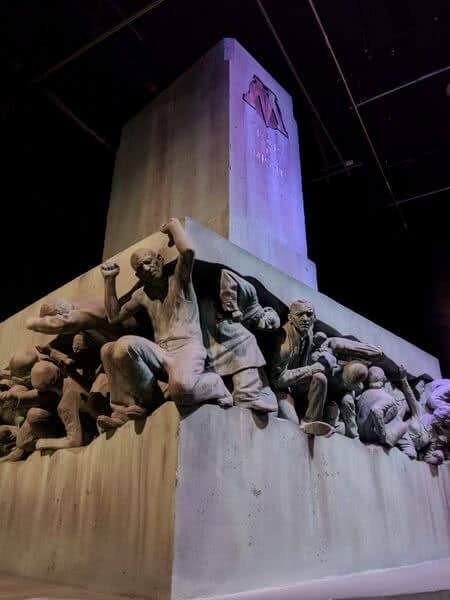 In the middle of the recession Warner Brothers invested Â£100 million into Leavesden, creating 300 jobs around the studio tour alone; and in 2012 the tour opened itsâ€™ doors. The Royalâ€™s watches were a bit slow (Muggles), and they officially opened it in 2013. Perhaps they were cautious; hilariously litigious Warner Brothers maybe treading on eggshells, they sold the rights for a Harry Potter theme park to Universal Studios in America. Now theyâ€™re like Mundungus Fletcher, looking over their shoulder, questioning: is this or that new exhibit too fun? Will we get sued?? Apparently Warner Brothers Studios have â€œNo ridesâ€�. 0.0. The rides aren't rides, they're 'photo opportunities', alright? Leavesden is just a cathedral to creativity. Well thereâ€™s the broomstick ride, the Goblet of Fire is a hoot; if you have kids, without Mad-Eye Moody willpower, the studio shop will take you for a ride. Oh no! Warner Brothersâ€™ UK president Josh Berger says visitors to Universal Studiosâ€™ Wizarding World enjoy "a noisy American" experience, with "claptrap". Berger says "Harry Potter fans are very passionate people. The experience here is a emotional one, to be in the actual Great Hall, to be in Diagon Alley. It's more of a British experience." TripAdvisor reported that The Making of Harry Potter has been the highest rated attraction worldwide every year since the tour opened. I think theyâ€™ve done us proud. 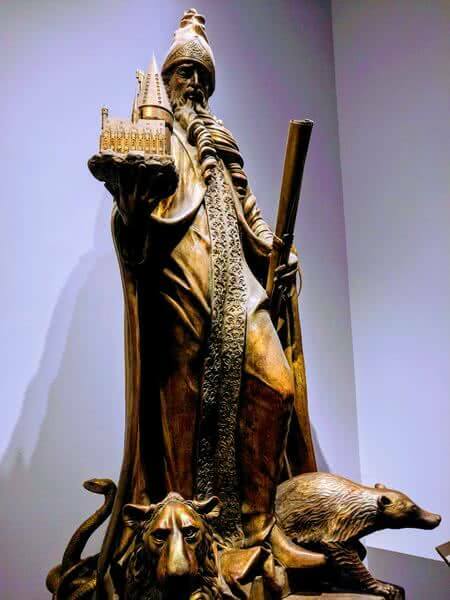 Boris thinks he'd be in Gryffindor, but just watch him - he's already got the yellow hair, built like a badger; London's major needs to look to Josh to reassure himself where he is (London mate) and then he can't even steal a wand properly; he's a turbo duffer! No murder-machine Deatheater at this point, it's Boris Longbottom. Did you feel a bit of wizard power when you sat in Dumbledore's chair Boris? 583 miles away I run walking tours in the birthplace of Harry Potter, tracing the Queenâ€™s companion of honour - JK Rowlingâ€™s inspirations. Without Rowling there would be no studio tour, Warner Brothers would be Â£7.7 billion poorer, our entire film industry's skillbase would be much reduced as would its' output. Iâ€™d love you to visit. Warner Brother's studio provided all the artistry - thankyou for a marvellous day out.